Once hunted nearly to extinction, cougars are currently once again on the decline, especially in the North West. Years ago their ecological success story that caused celebration, and just as the wolves in the NW, makes folks nervous as well. Worries are growing that the secretive cougar is getting comfortable around much of the human population. The true data, reality, is only 10 people were attacked fatally, within the United States since 1890. There have been no documented Cougar attacks in Oregon State. “We have a lot more people, actually urban-sprawl into wildlife domains, and with that some Cougar encounters — but simply not that many. Each encounter and the misinformation that goes with it, creates a quite dangerous environment for our Cougars here in Oregon. Often myth is much more dramatic than reality, and so goes the media as well,” said John Cox. Of the 10 fatal cougar attacks on people recorded since 1890 in the United States, half were in the past 10 years. Non-fatal attack-reports of cougars preying on pets and livestock on the increase, but mostly go non-confirmed. The problem with the pets and livestock, 90% of the time, is facts or reality sometimes swayed, especially by cattle and sheep ranchers, and have been caught many times doing so . . .
Cougars currently are pretty much a “Tale of Fear” rather than reality – and many ranchers and others who fear the Cougar demand its demise. Why? Well, imagination and tales upon tales become dramatic when a hunter or trapper states, “. . . ya, their all over the mountains out there,” swiftly becomes a mythic confirmation of “Cougar Overpopulation” defined. The fact is this is done without checking the counts, or even counting to see if correct for that matter. So are encounters a realty? Well, not so much, but certainly at times seemingly so for the non-participant or occasional visitor in the wilds. But the terminology spikes the definitive scale of misinformation, which then overspills into bias and even hate. Being attacked by a cougar, or even seeing one in the wild, is rare to many, to include hunters and trappers alike. One of the larger problems that exist — one attack captivates perception and fear in total. This is a somewhat daunting combination; suddenly one attack becomes 20 or even 30. The tales abound, and no one bothers to fact-check, but repeats the tale from friends – and if more than one had already obtained the information – then “By Damn” that’s confirmation of more. But how, exactly, can people live with one of North America’s most adaptable predators? A Cougar can sprint 40 mph and leap 20 feet into a tree. 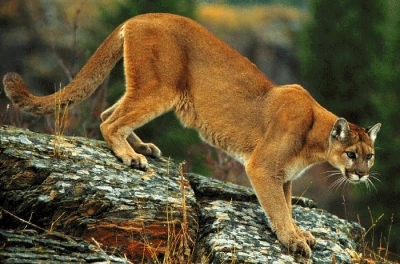 With its great yellow eyes and keen nose, it can see and smell people coming long before they know the Cougar is there. In Idaho, Montana, Wyoming and New Mexico, complaints from ranchers and deer hunters about too many Cougars prompted game officials to relax cougar-hunting rules. Then we discover urban sprawl as well as entire communities, knowingly, were built into, evasively, well known Cougar Habitats. Ironic, as these habitats, if left alone, could have protected the Cougar from invasive non-indigenous species – or humans, as we pander our philosophy toward ourselves being the dominant caretakers of our planet, supposedly. The West’s more urban coastal states, meanwhile, experience a more protective mind-set toward Cougars. Washington voters banned the use of hounds for recreational cougar-hunting in 1996, the same year that Oregon voters rejected a challenge to their state’s ban on hounds, which still exists to this day. People have a more holistic approach to sharing the land, not just with Cougars but with bears and other animals once considered varmints, and especially Apex Predators. “I think people like knowing these animals are out there, and many educated today acknowledge the fact of reforestation potentials directly involved with Apex Predators such as the Cougar, the Wolf, or the Bear. But not just reforestation, but moving wildlife-browsers around often can also save vegetation as well as much of the smaller wildlife from starvation.” John says enthusiastically. Biological Habitats are firmly based around a cohabitation principle. Certainly something we can learn for our nations wildlife, and even worldwide. The central argument, more implied than stated, is that still today wildness remains part of the architecture of the human soul, mind, and body, and that to thrive as individuals, and as a species, we need to cohabitate with ourselves and all of wildlife. In destroying Apex Predators’ we destroy humankind as well, and our natural ecological systems — if things do not change, our environmental destruction is already foreseen, by the year forecast of 2021, and we are doing it to ourselves — we can no longer blame the wildness . . .
One inherent problem with communicating is to acknowledge, understand, and agree upon the definition of words. I speak with many people and about our nation’s wildlife on a daily basis. The truth be known; words are often used as deception within this realm, used by those who do have something to hide. Ironically, during my discussions the terms “good science”, “emotion”, “data gathering”, among others, strike aggressively toward a condescending subjective-reasoning. Yes, they use these terms within the wrong context, oddly within a derogatory methodology, especially toward advocates or those who question their authority and decisions – some realize this, others simply repeat the terms as someone else has applied them, with no idea how out-of-place their reasoning becomes. When it comes to two terms as “emotion” versus “ignorance” when discussing the preservation of our nation’s wildlife, certainly a vast difference present, with the definition of each making this apparent. We have nothing to hide, most of us that is; but others . . . Allow me to take this situation a step further and bring in the reality, rather than contempt, and have a look at the definition of “science” and data gathering. Then to data itself, “. . . facts or information used usually to calculate, analyze, or plan something. But Oh-Oh, we have left out a term very significant within this dialogue. Everyone does not communicate truthfully, and within today’s government, non-profits, corporations, ranchers, and others there are simply many things to hide, mostly for profit or special interest. Since we now have a descriptive element of terms I will use within this context, we can remove ourselves from emotion — Yes, our government agencies that are responsible for managing our wildlife in America, use the deceptive form of emotion, for persuasion. Obvious? Quite so. Yes, they tell the general public, that all animal advocates and concerned taxpayers and citizens are emotional; which means within their truth, but mind you not within the capacity of the real definition of truth; thereby, real advocates and concerned citizens are and remain in error of proper judgement, within this scenario of wolves on federal and state lands. The truth is if we say anything at all contrary to deceptive and special interest types of research and wildlife management decisions, look out because here it comes, subjective-reasoning and ignorant name calling. From the Oregon Fish and Wildlife annual wolf count, at last count in early 2014, there were 64 wolves in Oregon – at the years end 77. The key debate here is the facts. Oregon’s continued wolf-recovery program opens up new questions about whether existing protections for the animals should continue. This is the ODFW terminology – scientists refute the discussion, stating it should not take place yet, and there is no long-term recovery at all that exists. “Gray wolves are listed under the state’s Endangered Species Act. ODFW announced last month that there are now eight breeding pairs in the state — enough to trigger a review of their endangered status.” Um, huh? Certainly this is not based on good science. . . Note: The official count of wolves crossing the boundaries into Idaho are not really prominent information yet, but we do have 2-confirmed, 4 from the packs have disappeared, and another 12 cannot be located for count, but were known to cross the boundaries into Idaho often. Once again we have a problem with a government agency and legitimate wildlife counts. The fact is this, we cannot eliminate every Apex Predator that kills an animal, and for being an Apex Predator. Today’s ranchers have moved into areas where, when I was younger and being raised in the N.W. — smart ranchers would not place their cattle. The fact is, in reality, fear is the dominate rule rather than the exception. Upon my observation within the countryside, and alongside many cattle herds grazing Public Lands. The many wolves I have viewed and out of sight from their view, simply pass through an area, a flatland, a valley floor, and ignore cattle and sheep quite readily. Getting to the other side of the basin, they simply disappear into the forest without event. This is fact, not emotion . . . There is a balance of nature within each ecological system. Then there exists cohabitation, of both human and wildlife and within terrestrial areas alike. Again, this is factual information, not of the realm of emotional dialectic as many federal and state wildlife managers would like others to perceive, and toward those that question current wildlife management activity, in reality to essentially demean all influence on questioning authority. The fact is also, without question, Public agencies should always be questioned, and open to questioning by the taxpaying Public. Environmental Assessments are unavailable most often, and through this we can surmise Wildlife Service’s killing-spree of wildlife simply a marginal fear-factor based project. The reasoning for killing wildlife on Public Lands or other Federal Lands and grazing areas, is based on fear, the reality of which never seems to appear as solid evidence, just emotion. Throughout the past 2 years we have found no evidence what so ever for several large killing-sprees of wildlife by Wildlife Services; nor, by the hidden and deceptive artificial structure of a County Trapper situation – Yes, ODFW knows full well they are in the wrong. When caught ODFW will deceive the public at large and speak of necessity. But they will not mention available proof of reasoning for the kills to have taken place at all, mostly due to the obvious fear factor that generated the killing-spree. Not so ironic, for a good example here, cattle ranchers cannot prove wolf kills of their cattle that often. When inspected for subsidy payments, we have found they simply lie 95% of the time. But this is not an innocent lie, rather it is in the order to have taxpayers pay for the mysterious death of a cow, and if a wolf they recover 100% of the cost of the cow – If death by Wolf Kill. One of the major problems that exist, just in perusal, is the fact if ODFW figures correct, then I would also be seeing more wolves and Cougars both, and much more of their kills – which I am not seeing at all in my daily ventures and photographing the Cascade Mountain Range. The ODFW numbers obviously incorrect, as in accord with their population figures, or estimates, they would not have any deer or elk left, just from the Apex Predator kills. Yes, very incorrect and based on emotional reasoning rather than science from the ODFW. With all emotion aside, one can travel the I-5, then through the Columbia River Gorge, or on highway 97, and see the deer population quite evident. Yes, auto and truck accidents have a definite effect on the deer population in Oregon – along with Poaching, which is in extremely large numbers as well. Poachers represent significant indiscriminate killing of deer and elk, while wolves kill to live. The poacher is more of a problem than wolves. The panel that developed the Oregon Wolf Management Plan addressed the hunting/poaching issue, though it hasn’t been the subject of media reports. Keep in mind the poacher tends to kill “trophy” animals, weakening the best breeding stock, whereas the wolf takes the weak, strengthening the gene pool. Then beyond Wildlife Services we also acknowledge this as a reality – I also see it quite extensively, and yet — Cattle and sheep overgrazing on Oregon public lands destroy far more elk and deer than do predators, by the outright destruction of many ecological zones. Taxpayer welfare for rich cattle and sheep ranchers, and their lobby groups, create an entirely different set of deceptions – often blaming wild horses, but so few left, now they want to blame Wolves and Cougars – and on it goes folks, the deceptions are in – and playing a significant political roll in the state of Oregon. The resolution is quite obvious here, especially in Oregon. It is simply time to cease the deceptions. The fact is, and quite without emotion, but rather, with a lot of American common sense, we know what needs to be done to resolve these issues – we need to act upon these common sense goals. Not ignore them. Within the contents of this article, many situations obvious and fear of Apex Predators unreasonable at best definition – too obvious to allow them to continue. Change is eminent, it has got to be. “Super majorities of Oregon’s House and Senate voted for a terrible new law (HB3188) that enables creation of predator killing districts at the county level. Those districts will tax participating real estate at one dollar per acre. The money will pay the U.S. Department of Agriculture’s (USDA’s) Wildlife Services to kill predators at the request of commercial agriculture and livestock operators. Don’t confuse the USDA’s Wildlife Services with the U.S. Department of Interior’s Fish & Wildlife Service, a vastly different federal agency. This law may spread to other states. The USDA’s Wildlife Services is notorious for slaughtering many species of wildlife, not just predators. In 2014, Wildlife Services killed 2,713,570 animals nationwide, down from 4,378,456 the year before. The 2014 kills include 570 black bears, 322 gray wolves, 61,702 coyotes, 2,930 foxes and 305 mountain lions, as well as three bald and five golden eagles. 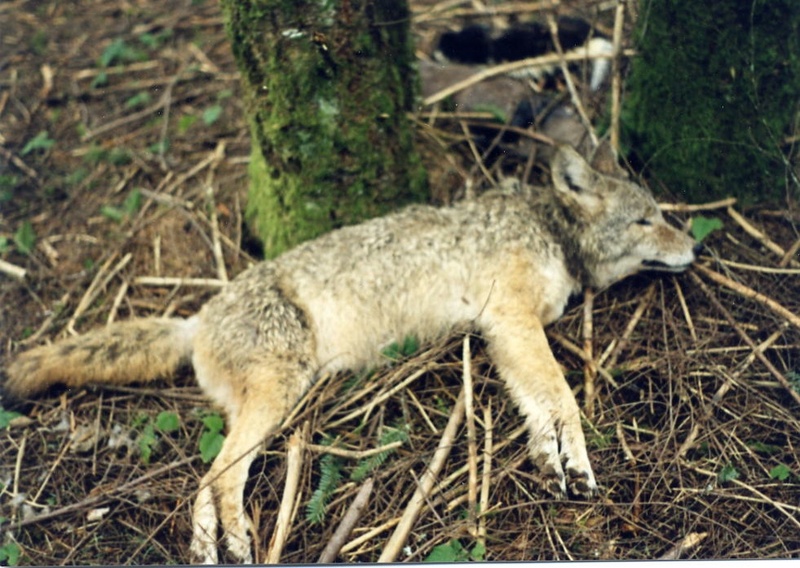 The federal trappers use cyanide capsules, neck snares and foot traps. When I was a wildlife biology student in Arizona, my classmates and I called these trappers the “gopher chokers”. They kill many animals unintentionally … collateral damage … including 390 out of 454 river otters in 2014. Who knows how many pets they kill? Pet kills are seldom reported. The trappers follow the S-S-S mantra: shoot – shovel – shut-up. 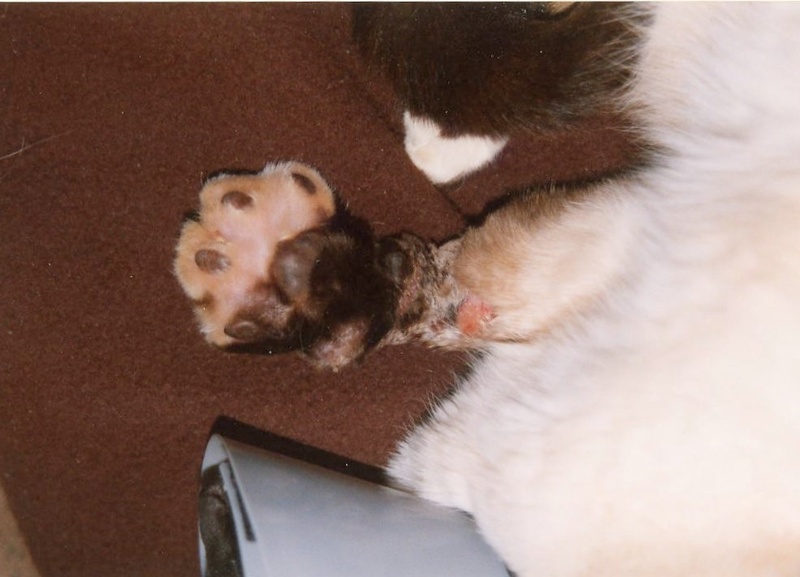 They shoot domestic pets caught in their foot traps, bury them and keep quiet. 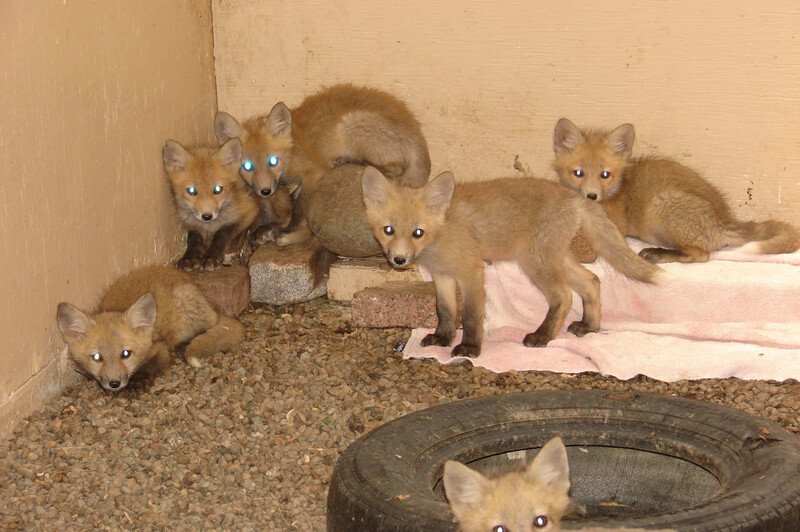 The following links and photos illustrate the very real risk Wildlife Services’ traps and poisons pose to wildlife, people, and their pets. Most show animals injured or killed as the result of Wildlife Services’ methods. WARNING: Many pictures are very graphic and may not be suitable for children. Domestic cat injured in leg hold trap set by Wildlife Services. Leg was later amputated. Young puppy suffers after being caught in Wildlife Services’ necksnare. 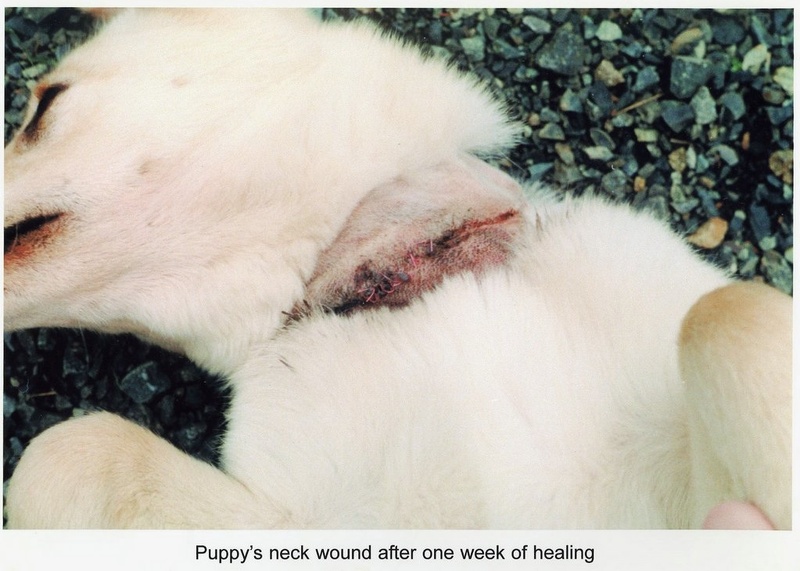 The puppy was discovered by area residents and the photo was taken after one week of healing. 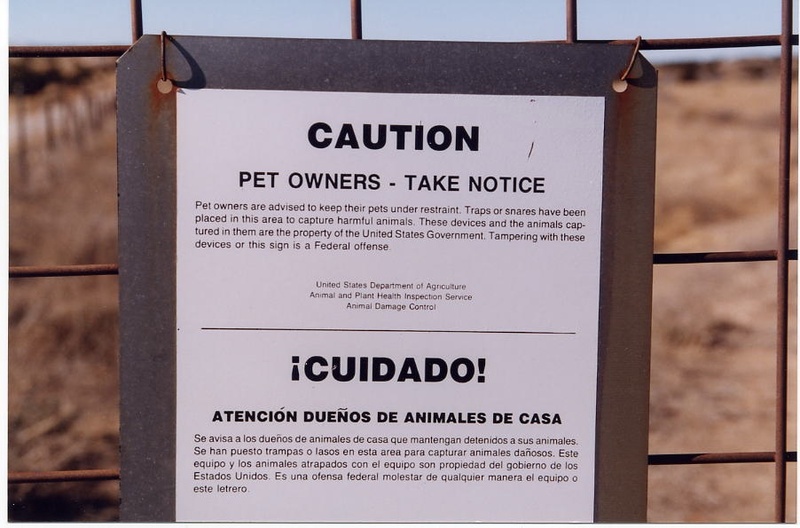 Warning signs required to be posted by Wildlife Services. Often the signs are not posted or are missing. School children in Montana pose with wolves that Wildlife Services killed with aerial gunning in 2004. Seven wolves were killed in this incident. Cougars killed by Wildlife Services. 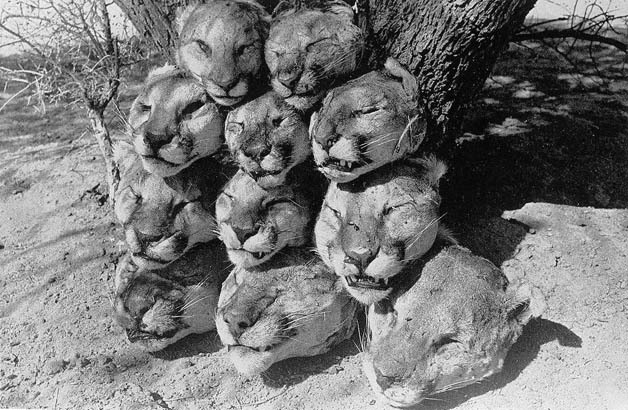 This infamous photo of the severed heads of 11 mountain lions was taken by an outraged employee of the Arizona Game and Fish Department. These animals were among 24 lions killed by the federal agency Animal Damage Control (now called Wildlife Services) in the Galiuro mountains of Arizona, a wilderness area North of Willcox. All were killed on federal lands on the Coronado National Forest over a six-month period from December 1988-May 1989. While it is uncertain whether any of these cougars ever preyed on livestock, the ostensible purpose of the killings was to protect cattle that were grazing on public lands. This type of indiscriminate lethal predator control continues in almost all of the states where mountain lions occur. California is an exception in that only specific mountain lions documented to have killed livestock or threatened people are subject to lethal control by wildlife agencies. Also, in California no sport hunting of mountain lions is allowed. Current data on animals killed by USDA Wildlife Services is available on their website. Their presentation is not user-friendly, which is telling. We have already seen through the years what the problem with our environment and wildlife continues to be. Worse still is the continued ineptness within our government agencies, both state and federal, that continue the precise non-effective management principles. When American’s / Taxpayers state the obvious about the neglectful management situation that has existed for so long, we are all either ignored, or spoke to condescendingly as if we know nothing. The more recent innuendo, or rhetoric, to cover-up incompetence within their mismanagement and toward those that disagree with the government employees, often told they are too emotional and simply complainers. The problem is this – many who are discussing the noteworthy bad management paradigms and dynamics of incompetence in the decline of our nations environment and wildlife, do know and have the knowledge to put-forth proper complaints. But rather than dwell on this, let’s look at what we can do to resolve these issues. We can indeed outline circumstances that can develop into a proper procedure, and actually still resolve the issues of our environment and wildlife. It’s a start in the right direction. Phase 1: Here is where we begin. We can start the alleviation procedure, which may lead to the development of a set of natural and cultural management needs. We need to stop looking at the narrow landscape of special interest, and start looking at what the priorities are, and methods of enhancing the priorities of sustainability and cohabitation of all. This is of urgency, as we are at the worse-case scenarios of reality for both our environment and our wildlife, due to neglect and ignoring specific priorities of life and cohabitation within both our environment and wildlife habitats. Yes, it is time those that have the proper knowledge, and humane spirit step in and correct the mess made by those who are and remain ignorant and non-compatible to American’s needs. It is this easily seen and done. We need to prioritize these into mechanisms toward incorporating these priorities into management, with appropriate budgets and highly qualified staff and researchers. Truth is what is required now, not random and arrogant rants of what someone’s perception of our environment may be or the “wants to kill” more wildlife – but true and good science, as well as Humane principles toward each. Phase II: This we hope will and can lead to a comprehensive and aggressive Resources Management Plan for each specific area of resolving worst-case scenarios, toward resolution of an ongoing appropriate management paradigm and plans. The priority within this particular stage is to develop and enhance our environment to a “living standard” of health and coexistence with both human and wildlife. The priority toward the wildlife is to enhance their living conditions, often to be left alone, with little to no management what so ever. The multi-use phase, of cohabitable public lands, is very much ignored today, yet in print and in many of the conversations in the matter of management, but within such a narrow-scope it is left ignored mostly. It becomes apparent that Moderation is also a consideration toward developing and increasing our living standards, and toward Cohabitative relationships. This can involve both our Environment (cattle for example) as well as our Wildlife, and at the same time certainly enhance our individual life as well – given the Humane Structure of good ethical management of both. Unfortunately, there are no actions directly involved in this ideology of Multi-Use that currently exists in America. So new priorities toward what exactly Multi-Use is and how it can be developed for the common good of all, not just a few, is the road to resolution in this matter of fixing the current problems. Some of the more sever or pervasive problems will have to be funded and approached with not only priority, but aggressively mandated by law, regulatory oversight, and policy changes. Many situations have surpassed even the worse-case scenario toward oblivion, and wildlife species have been sent to extinction due to government ignorance combined with arrogance. Many of these government employees will simply have to leave their positions, due to their irresponsible actions and arrogant methodologies. The significance of change is very important currently. As most American’s have lost their trust with both politicians and government employees – and for good reasons. Our notes here, for a substantial change in at least government, should be a pathway to humane and sound reasoning toward management of America’s lands and wildlife. We need to be Proud of our Nation once again, instead of stricken with feelings of sadness, compounded with the situation of being told there is nothing we can do as Americans to decide our own fate, as United States of America’s citizens’; or angry toward our government and told there is nothing we can do so accept it and go away. Phase I / Phase II: Both of these circumstances must have a relevant “tracking-system” and noteworthy policy toward reports. This is accumulative part of the Checks-n-Balance system that is so much needed within government today. Proper training within these systems is also a mandatory situation, and should be governed by merit and integrity, not advancement due to favoritism or friendship, but rather due to accomplishment, ethical practice standards, as well as abiding by law of both reason and necessity – currently neither of these situations are in-place, and there exists no situation of who is responsible to fulfill commands, and who is in command of the objectives. Laws, policy, and regulatory measures often ignored today due to special considerations toward a narrow group of special interests – wildlife goes extinct, our environment almost non-livable, and government employees simply shrug off with complacency, then move on to continue their destructive behavior – and it’s allowed. It is simply time we as American’s Stand Up and demand Change. No longer is it acceptable to be the ignored majority. We are surrounded by total ignorance at times, and these are the people that are making significant decisions for all of our future, to include our environment and our wildlife. The next paper/article will be directly involved with more productive management paradigms and principles. We want to establish that there are roads to travel that do and can enhance our life, and extend our cohabitation boundaries to a more acceptable level of living, for both humans and our natural surroundings – together, not displaced for the benefit of just a few, or to make a buck here or there – but toward a good, positive quality of life for all. Bellows, B. C. March 2003. Protecting riparian areas: Farmland management strategies. Soil Systems Guide, Appropriate Technology Transfer for Rural Areas. At http://www.attra.ncat.org. Belsky, A. J., A. Matzke, and S. Uselman. 1999. Survey of livestock influences on stream and riparian ecosystems in the western United States. Journal of Soil and Water Conservation 54(1): 419-431. Bohn, C. C., and J. C. Buckhouse. 1986. Effects of grazing management on streambanks. Trans. N. Am. Wildl. Natl. Resour. Conf. 51:265-271. Bryant, H. T., R. E. Blaser, and J. R. Peterson. 1972. Effect of trampling by cattle on bluegrass yield and soil compaction of a meadowville loam. Agron. J. 64:331-334. Chichester, F. W., R. W. Van Keuran, and J. L. McGuinness. 1979. Hydrology and chemical quality of flow from small pastured watersheds: Chemical quality. J. Envir. Qual. 8(2): 167-171. Cole, D. W., 1981. Nitrogen uptake and translocation by forest ecosystems. In: F. E. Clark and T. Rosswall (eds.) Terestrial Nitrogen Cycles. Ecological Bulletin. Vol. 33. p. 219-232.
Cooper, A. B., C. M. Smith, and M. J. Smith. 1995. Effects of riparian set-aside on soil characteristics in an agricultural landscape Implications for nutrient transport and retention. Agric. Ecosystems Environ. 55:61-67. Gardner, J. L. 1950. Effects of thirty years of protection from grazing in desert grassland. Ecology. 31:44-50. Generic Environmental Impact Statement on Animal Agriculture: A Summary of Literature Related to the Effects of Animal Agriculture on Water Resources (G), 1999. The Environmental Quality Board, College of Agriculture, Food, and Environmental Sciences (COAFES), Univ. of Minnesota. Green, D. M., and J. B. Kauffman. 1989. Nutrient cycling at the land-water interface: The importance of the riparian zone. In: R. E. Gresswell, B. A. Barton, and J. L. Kershner (eds.) Practical Approaches to Riparian Resource Management: An Education Workshop. U.S. Bureau of Land Management. Billings, MT. p. 61-68. Gregory, S. V., F. J. Swanson, W. A. McKee, and K. W. Cummins. 1991. An ecosystem perspective of riparian zones. Bioscience 41(8): 540-550. Hack-ten Broeke, M. J. D., W. J. M. De Groot, and J. P. Dijkstra. 1996. Impact of excreted nitrogen by grazing cattle on nitrate leaching. Soil Use Manage. 12:190-198. Jawson, M. D., L. F. Elliott, K. E. Saxton, and D. H. Fortier. 1982. The effect of cattle grazing on nutrient losses in a pacific northwest setting, USA. J. Environ. Qual. 11:628-631. Kaufmann, J. B., and W. C. Kreuger. 1984. Livestock impacts on riparian ecosystems and streamside management implications: A review. J. Range Manage. 37:430-438. Knapp, R. A., V. T. Vredenburg, and K. R. Matthews. 1998. Effects of stream channel morphology on golden trout spawning habitat and recruitment. Ecol. Appl. 8:1104-1117. Lemly, D. A. 1982. Modification of benthic insect communities in polluted streams: Combined effects of sedimentation and nutrient enrichment. Hydrobiologia. 87:229-245. Li, H. W., G. A. Lamberti, T. N. Pearsons, C. K. Tait, J. L. Li, and J. C. Buckhouse. 1994. Cumulative effects of riparian disturbances along high desert trout streams of the John Day Basin, Oregon. Trans. Am. Fisheries Soc. 123:627-640. Magilligan, F. J., and P. F. McDowell. 1997. Stream channel adjustments following elimination of cattle grazing. J. Am. Water Resour. Assn. 33:867-878. Marcuson, Patrick E. 1977. Overgrazed streambanks depress fishery production in Rock Creek, Montana. Fish and Game Federation Aid Program. F-20-R-21-11a. McColl, R. H. S., and A. R. Gibson. 1979. Downslope movement of nutrients in hill pasture,Taita, New Zealand: 2. Effects of season, sheep grazing and fertilizer. New Zealand J. Agric. Res. 22:151-162. Meyers, T. J., and S. Swanson. 1991. Aquatic habitat condition index, stream-types and livestock bank damage in northern Nevada. Water Resour. Bull. 27:667-677. Minshall, G. W. 1984. Aquatic insect substratum relationships. In V. H. Resh and D. M. Rosenberg (ed.) The ecology of aquatic insects. Praeger Publishers, New York. p. 356-400. Mwendera, E. J., and M. A. M. Saleem. 1997a. Infiltration rates, surface runoff, and soil loss as influenced by grazing pressure in the Ethiopian highlands. Soil Use Manage. 13:29-35. Mwendera, E. J., M. A. M. Saleem, and A. Dibabe. 1997. The effect of livestock grazing on surface runoff and soil erosion from sloping pasture lands in the Ethiopian highlands. Australian J. Experimental Agric. 37:421-430. Naeth, M. A., and D. S. Chanasyk. 1996. Runoff and sediment yield under grazing in foothills fescue grasslands of Alberta. Water Res. Bull. 32:89-95. Naiman, R. J., and H. Decamps. 1997. The ecology of interfaces: Riparian zones. Annual Review of Ecology and Systematics. V. 28. p. 621-658. Olness, A., S. J. Smith, E. D. Rhoades, and R. G. Menzel. 1975. Nutrient and sediment discharge from agricultural watersheds in Oklahoma. J. Environ. Qual. 4:331-336. Ohio’s Hydrologic Cycle. 1994. L. C. Brown. AEX 461. Ohio State University Extension. Orodho, A. B., M. J. Trlica, and C. D. Bonham. 1990. Long term heavy grazing effects on soil and vegetation in the four corners region. 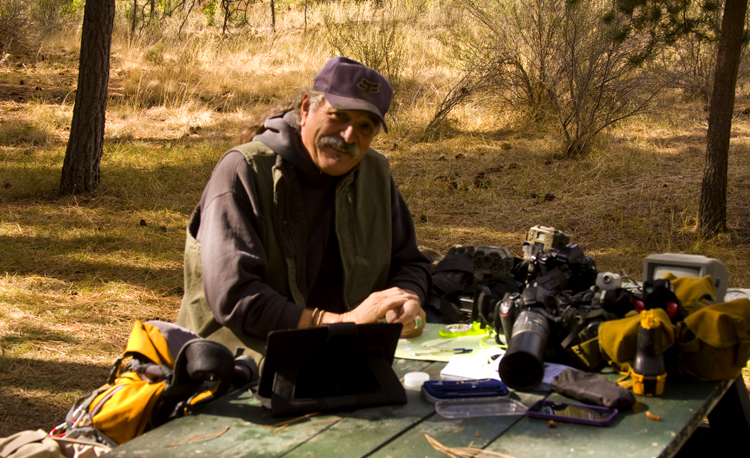 Southwest Naturalist. 35:9-14. Owens, L. B., W. M. Edwards, and R. W. Van Keuren. 1989. Sediment and nutrient losses from an unimproved all-year grazed watershed. J. Environ. Qual. 18:232-238. Owens, L. B., W. M. Edwards, and R. W. Van Keuren. 1996. Sediment losses from a pastured watershed before and after stream fencing. J. Soil Water Conserv. 51:90-94. Owens, L. B., W. M. Edwards, and R. W. Van Keuren. 1997. Runoff and sediment losses resulting from winter feeding on pastures. J. Soil Water Conserv. 52:194-197. Owens, L. B., W. M. Edwards, and R. W. Van Keuren. 1983. Surface runoff quality comparisons between unimproved pasture and woodlands. J. Environ. Qual. 12:518-522. Owens, L. B., W. M. Edwards, and R. W. Van Keuren. 1994. Groundwater nitrate levels under fertilized grass and grasslegumes pastures. J. Environ. Qual. 23:752-758. Richards, R. P., F. G. Calhoun, and G. Matisoff. 2002. Lake Erie agricultural systems for environmental quality project. J. of Envir. Qual. 31:6-16. Rabalais, N. N., R. E. Turner, and W. J. Wiseman, Jr. 2001. Hypoxia in Gulf of Mexico. J. of Envir. Qual. Mar-Apr 30(2):320-329. Platts, W. S. 1991. Livestock grazing. In: Influence of forest and rangeland management on Salmonid fishes and their habitats. American Fisheries Society, Special Publication 19:389-423. Platts, W. S., and R. F. Nelson. 1985. Stream habitat and fisheries response to livestock grazing and instream improvement structures, Big Creek, Utah. J. Soil Water Conserv. 40:374-379. Platts, W. S. and F. J. Wagstaff. 1984. Fencing to control livestock grazing on riparian habitats along streams: Is it a viable alternative. N. Am. J. Fisheries Manage. 4:266-272. Peterjohn, W. T., and D. L. Correll. 1984. Nutrient dynamics in an agricultural watershed: Observations of a riparian forest. Ecology 65: 1466-1475. Rauzi, F., and C. L. Hanson. 1966. Water intake and runoff as affected by intensity of grazing. J. Range Manage. 19:351-356. Schepers, J. S., and D. D. Francis. 1982. Chemical water quality of runoff from grazing land in Nebraska: I. Influence of grazing livestock. J. Environ. Qual. 11:351-354. Schepers, J. S., B. L. Hackes, and D. D. Francis. 1982. Chemical water quality of runoff from grazing land in Nebraska: II. Contributing factors. J. Environ. Qual. 11:355-359. Sidle, R. C., and A. Sharma. 1996. Stream channel changes associated with mining and grazing in the Great Basin. J. Environ. Qual. 25:1111-1121. Smith, C. M. 1989. Riparian pasture retirement effects on sediment phosphorus and nitrogen in channellized surface run-off from pastures. New Zealand J. Mar. Freshwater Res. 23:139-146. Stout, W. L., S. A. Fales, L. D. Muller, R. R. Schnabel, W. E. Priddy, and G. F. Elwinger. 1997. Nitrate leaching from cattle urine and feces in northeastern U.S. Soil Sci. Soc. Am. 61:1787. Sweeny, B. W. 1993. Effects of streamside vegetation on macroinvertebrate communities of White Clay Creek in eastern North America. Proc. of the Natural Science Academy of Philadelphia. 144:291-340. Tait, C. K., J. L. Li, G. A. Lamberti, T. N. Pearsons, and H. W. Li. 1994. Relationships between riparian cover and community structure of high desert streams. J. N. Am. Benthological Soc. 13:45-56. USEPA. 2000. National Water Quality Inventory: 2000 Report to Congress Executive Summary, Office of Water, Washington, DC 20460. [Online] Available at http://www.epa.gov/305b. Waters, T. F. 1995. Sediment in streams, sources, biological effects and control. American Fisheries Society Monograph 7. White, R. K., R. W. VanKeuren, L. B. Owens, W. M. Edwards, and R. H. Miller. 1983. Effects of livestock pasturing on non-point surface runoff. Project Summary, Robert S. Kerr Environmental Research Laboratory, Ada, Oklahoma. EPA- 600/S2-83-011. 6p. Williamson, R. B., C. M. Smith, and A. B. Cooper. 1996. Watershed riparian management and its benefits to a eutrophic lake. J. Water Res. Planning Manage.-ASCE. 122:24-32. Williamson, R. B., R. K. Smith, and J. M. Quinn. 1992. Effects of riparian grazing and channelization on streams in Southland New Zealand I. Channel form and stability. New Zealand Journal of Marine & Freshwater Research. 26:241-258. Wohl, N. E., and R. F. Carline. 1996. Relations among riparian grazing, sediment loads, macroinvertebrates, and fishes in three central Pennsylvania streams. Can. J. Fisheries Aquatic Sci. 53(suppl. 1):260-266. The Wild Horse and Burro Act, in 1971, was indeed purposeful. When combined with other Laws, and initiated as part of a conservation effort to provide America and our government with actions to start safeguarding America’s Public Lands, there existed strength in the law. Government agencies and special interests chipped-away at those laws, to the shell of the law which exists today, with no reliable content. By the 1980’s there grew enormous considerations to not only assess the apparent nature and resource problems, but many observed throughout the following years the magnitude and the environmental threats that began to exist under government agency responsibility. The assessments and accountability toward each foreseen the events of today – a thorough mismanagement of America’s Public Lands, as well as forestry, and combined with extreme faulty wildlife management. We find the destruction of Public Lands quite obvious – the mismanagement of America’s wildlife to such a point there exists only 50% actually alive today; this fact is very important to us all, as many significant attributes to such elements as reforestation and other sustainability situations provide our healthy existence on this planet. Let’s be clear about this — these are not options — these are mandatory, I repeat here, sustainability situations for our survival on this planet of ours; and to cease this type of mismanagement is a mandatory reality right now – today! We have honest scientists stating clearly that both humans and wildlife do not appear to remain sustainable in the near future, if the current situations remain in place; our sustainability upon this planet appears questionable past 2021, which means we will have destroyed all the significant “things” we needed to sustain life past this date of 2021. . . America, we have a problem! The point is that many times these elements assuredly given to legislators as well as upper management and supervisory staffs in government, but ignored by the more current and passive government agencies, to the point of sever irresponsibility, which often leads to criminal activity as well. The irresponsibility and incompetence simply grew worse out of a tragic blatantly capacity to service special interest groups only. The current mind-set of many, this author included, is if the government is going to be a business-support outlet only, then they should be treated like a business – No More Monopolized Public Lands — their responsibility to manage America’s Lands should be revoked! As far as we can deduct the actual acres government agencies are responsible for remains confusing at best; and believe me much of the information is hidden, or stuck in a book somewhere in a small county office where cobwebs and black widows await trespassers. So the sum of all that acreage that is available for us to observe, or judicially owned by our Federal government is 2.27 billion acres of land, mostly in the western United States. In the East, for example, it is estimated at 467,759 acres of land on the here-and-there approach toward designation – in truth just an average, just as above and out west. But this is not about land ownership, it is about mismanaged lands, both Federal and State, and what it is we as America can do about it as soon as possible. Our very life and the cohabitation of those wildlife and vegetation and waterways depend on our conducting a truthful and responsible methodology of conservation, with “humane principles” and “ethical management” a priority. But this is due to the undermining of laws, by special interests and coexistence with federal employees — sadly, the situation grew way beyond Conflict of Interest, and many say illegal attributes toward criminality exist within both of these special interest groups combined with federal employees and their Behind-Closed-Doors negotiating. Think about that the next time a cattle rancher, an oil executive, a mining executive, or any corporation in search of profits by the use of Public Lands, and tells you, “ . . . Oh, its all okay, as those others,” pointedly looking at those who discover the conflicts-of-interests and say with a smirk and condescending voice, “. . . who say it is not, are simply too emotional, and really do not see the reality. Then they give you a vast Howdy-Doody smile – in a salesman type jest, as if they are angelic and here to assist you in your life endeavors. No, they are not. It is a fact they are on Public Lands to take advantage of government agency mismanagement mixed with incompetence, in total. And right now they are destroying Public Lands at a rapid pace, and eliminating much of America’s wildlife – with a smile on their face and telling everyone everything is okay. We are a group of people, of advocates, who agree that everything on this planet is connected, and referenced as such by good science. This group distinguishes itself with principles of sound ethics, of sound management theory toward application, of humane reasoning, integrity, as well as Humane Principle’s of management and administering corrective actions to America’s Federal Lands – Public Lands belong to all American’s, and that’s the bottom line here. This is not within the landscape of emotion, rather, a sound theory and process of establishing paradigms to enhance or to increase our survival percentages right here on our Planet Earth; which currently is low, to extremely low in chances of survival for even another century. We have found, within an undebatable context, no one is watching out for American’s interest. What we have found is our legislator’s have certainly represented, over the past couple of decades, special interests and conflicting attributes of benefit themselves only. So we are suggesting Mitigation Programs for the significant problems that have not only been quantified within the past decade, quite readily; but we also understand there does exist also, off-shoot programs to better understand the problems and threats not yet documented. Government agencies today are not achieving proper management levels through their catastrophic, destructive, and irresponsive management paradigms. The fact is many government agencies are mismanaging America’s Environment, wildlife, and federal lands, because there is no checks and balance systems in place. Catch-as catch-can permits issued for profit, combined with special interests and ignoring laws, is not management, and never has been. It is neglectful and irresponsible. Once again this is not emotional reasoning, but stemmed from what we see daily from government agencies. sound science, logic, many appropriate and well referenced studies, and an extraordinary amount of effort to explore the many regions in question – government lands in its entirety. The reality is much of the destruction and complacency toward the overwhelming destruction, in truth, is not a problem that is difficult to see at all. Once again the overwhelming truth does not change, but our government seems to want a different perception of the truth, or to convince us they are competent managers of our lands and wildlife; which it is obvious they are not, as there exists too many questions that remain ignored or unanswered, and too may ecological biosphere’s damaged beyond repair due to mismanagement. Lastly, within this discussion, American’s demand that we place no limitations on science or research, in order to obtain the truth of matters of significance of life on this planet, and the sustainability of it cohabitating within its proper balance and systematic growth – an All-Data and Thorough-Data management situation to be definitive and put into place, and protected by Law, as well as the Truth within things such as Environmental Assessments and other pertinent information given to the public and administrators of Biological Habitats and management of each. 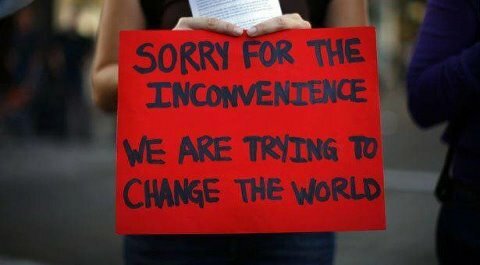 It is now time for change and that includes changing the entire structure of these government agencies – I would state actually, American’s need to demand a Change for Resolution and for our Very Existence on this planet of ours – Planet Earth! Papers to follow. Editorial, Agriculture’s Misnamed Agency, New York Times (July 19, 2013); Bergstrom, J.B., Arias, L.C., Davidson, A.D., Ferguson, A.W., Randa, L.A. & Sheffield, S.R., 2013, License to kill: reforming federal wildlife control to restore biodiversity and ecosystem function, Conservation Letters, v. 6, p. 1-12. Neighbors of Cuddy Mountain v. U.S. Forest Serv., 137 F.3d 1372, 1379 (9th Cir. 1998) (“Some quantified or detailed information is required. Without such information, neither the courts nor the public, in reviewing the [the agency’s] decisions, can be assured that the [agency] provided the hard look that it is required to provide.”). Brainerd SA, Andrén H, Bangs EE, Bradley EH, Fontaine JA, et al. (2008) The effects of breeder loss on wolves. J Wildl Manage 72: 89–98. http://onlinelibrary.wiley.com/doi/10.2193/2006-305/abstract. Bull, Joseph, et al. “Survival on the border: a population model to evaluate management options for Norway’s wolves Canis lupus.” Wildlife Biology 15.4 (2009): 412-424.http://www.bioone.org/doi/abs/10.2981/08-010. Gehring TM, Kohn BE, Gehring JL, Anderson EM (2003) Limits to plasticity in gray wolf, pack structure: conservation implications for recovering populations. Can Field-Nat 117: 419–423. Knowlton FF, Gese EM, Jaeger MM (1999) Coyote depredation control: and interface between biology and management. J Range Manage 52: 398–412. Wild horses and burros are supposed to be treated as “components of the public lands”. 16 U.S.C. § 1333(a) The law is clear that “wild free-roaming horses and burros shall be protected from capture, branding, harassment, or death” and entitled to roam free on public lands where they were living at the time the Act was passed in 1971. 16 U.S.C. § 1331 These legally protected areas are known as “herd areas,” and are defined as “the geographic area identified as having been used by a herd as its habitat in 1971.” 43 C.F.R. § 4700.0-5(d). The WFRHBA also authorizes designation of specific ranges for wild horses and burros. “Range’ means the amount of land necessary to sustain an existing herd or herds …and which is devoted principally but not necessarily exclusively to their welfare in keeping with the multiple-use management concept for the public lands”. 16 USCS §§ 1332(c), 1333(a). In 1971 the Wild Free Roaming Horses and Burros Act (WFRHBA) was passed to provide broad protections for wild horses and burros on public lands. The law states that “wild free-roaming horses and burros are living symbols of the historic and pioneer spirit of the West…[T]hey contribute to the diversity of life forms within the Nation and enrich the lives of the American people”. 16 U.S.C. §1331 et seq. The BLM is directed to protect the wild horses and burros “in a manner that is designed to achieve and maintain a thriving natural ecological balance on the public lands” and “protect the natural ecological balance of all wildlife species which inhabit such lands, particularly endangered wildlife species. Any adjustments in forage allocations on any such lands shall take into consideration the needs of other wildlife species which inhabit such lands.” 16 U.S.C. §1333(a). The Public Rangelands Improvement Act of 1978 amended the WFRHBA to require BLM to determine appropriate management levels (AML) and maintain an inventory of wild horses and burros to help achieve these goals. The BLM has interpreted the WFRHBA to mean it can “manage” wild horses and burros with the goal of allowing multiple uses on all public lands including the herd areas. But, though the statute mentions “multiple-use relationship” in connection with specified ranges, it is very clear that the directive is to manage these animals otherwise only to “maintain a thriving natural ecological balance on the public lands” and “protect the natural ecological balance of all wildlife species which inhabit such lands, particularly endangered wildlife species”. In effect, WFRHBA authorizes only limited interference with wild horses and burros in herd areas where they were living in 1971. Nothing about removing wild horses and burros from herd areas where they lived in 1971 to allow multiple use such as cattle grazing, recreation for off road vehicles, mining or development. Also, protecting the ecological balance of all wildlife has never meant rounding up and removing whole species. Especially when there is a law that explicitly protects their right to exist in historic herd areas. Even designated ranges managed under a multiple use concept are to be “devoted principally” to wild horses and burros. The wild horses and burros on these lands are not to be eliminated for cattle or mining or recreation or even secondary to these other uses. Despite the limited authority to interfere with wild horses and burros under WFRHBA, the BLM has decided, however, the multiple public use concept applies to all herd areas as well as ranges. Yet, the WFRHBA says only that wild horses and burros “are to be considered in the area where presently found, as an integral part of the natural system of the public lands”. 16 U.S.C. §1331. Essentially the BLM, for example, is in contempt, or in illegal realms when they manage the wild horse herds as they do today – due diligence for every American to know the laws is the only way to make government agencies to abide by the laws just as we have to do on a daily basis . . .
Let’s discuss a sub agency at the USDA called Wildlife Services. One must be leery at best here, as we then enter into psychotic realms, where no less of an explanation exists — the killing of 20.2 million animals — America’s Wildlife. The Landscape: America’s Wild Lands. Our wildlife is being killed within negligent parameters. Method and irresponsible management is obvious, yet ironically ignored. Wildlife Services uses our taxpayer-based-money extraordinarily, to kill wildlife. Currently we are looking at a harsh reality — the actual lose of nearly 50% of our nation’s wildlife (i.e. data and statistics from the Living Planet Index). You’ve never heard of this agency? Many have not, and why this agency gets away with what they do. Their personnel abuse and kill wildlife with no other apparent reasoning, other than misleading information or hidden agendas and covered up lies. This ironic situation is apparently the norm in wildlife management today, in both State and Federal government agencies; although, Wildlife Services leads the way in extreme behavior and one can say truthfully, oddly, a hatred toward wildlife. Time for change! And yes, we could be discussing the Bureau of Land Management here as well, and their atrocities and psychopathic behavior patterns also, as their management paradigms quite destructive as well, with a similar and odd antagonistic behavior and psychotic hatred toward America’s wild horses. With so much of an abundant kill-statistic of animals, one has got to wonder about our government and the mind-set that currently exists. Obviously, Wildlife Services uses no science their approach within management levels or in the matter of their actions, of killing wildlife. Yes, those that should not be responsible for animals, especially managing any part of our nation’s wildlife, are in positions of responsibility — yet their irresponsible actions and behavior quite obvious. But why am I making these statements? In truth, we the people of America have got to wonder what happened to humanity within our government, and all it conveys within ideology, especially within a perspective of day to day management of our wildlife. We can attest that if our government is reflective of its population and voters, our country, America is in dire need of change, especially within wildlife management. “As far as I know those government trappers are supposed to take care of marauding animals that are doing public damage. Some of those people just do killin’ to be killin’. . . those here like this fellow at Wildlife Services ya mentioned, I heard of him, sadly, and he’s another story all together. His reputation of how he would trap an animal, then club it to death out of pure sick-joy – like he enjoyed it. Not a fellow I really care to know, but know of him. I don’t agree with that.” — Bob Pritchett, 75 year resident of Southern Oregon – (this author also a 64 year resident of the Northwest). Near the turn of this century, 1998-99, wildlife-kills hit a staggering 4 million. Two years later, in 2001, it fell to about 1.5 million and stayed relatively low. Unimaginable, this mind-set of several million animals dying yearly is a “norm” for this government agency – simply amazing and defies logic. Perhaps psychotic is an understatement here. But in 2008, the number of kills rocketed to 5 million before trending downward to 3 million over the next four years. These figures staggering to say the least – to even suggest this amount within a yearly rate to be okay, is disgusting to many Americans. Even more disgusting, we paid them via our taxpayer money to kill. Now it’s back up, well past 4 million in the most recent count, and critics, actually normal folks and taxpayers, those that have found out about this agency, are pressing for a better explanation for why. They are getting no answers. In reality, there are simply no answers or excuse to give. These numbers, as I repeat, are extraordinary and defy the reasonable conduct of people that should or would be expected. In 2014 there were minimal – their language and not mine — assessments of 3.2 million animals, mostly wildlife, killed by this same agency. In July of 2015 an estimated 2.7 million wildlife species killed by this same government agency, Wildlife Services, by July of this year. But wait there is more, and the plight of our nation’s wildlife worsens to a catastrophic level of negligence – believe it or not, statistics and LPL Index Standards have been not only reasonably accurate over the past decade, but at the advent of the LPL Index, our methodology has increased to extremely accurate, both in data gathering and statistical truth. Estimates without the LPL Index rise to an 80% extinction level of wildlife worldwide; in America the LPL Index has it at 60% extinction. Yes, as your jaw dropped and under your breath you may have mumbled, “Unbelievable”, in an astonished manner. I did as well. My heart sunk. The Nature Report, exclusive of the LPL Index, estimates somewhere between 500 and 36,000 species a year are going extinct. Oh, it gets worse – the Nature analysis predicts that 75% of life on Earth, at the rate we are going and/or combined with ignoring the causes (i.e. cattle, too much industry, et al. 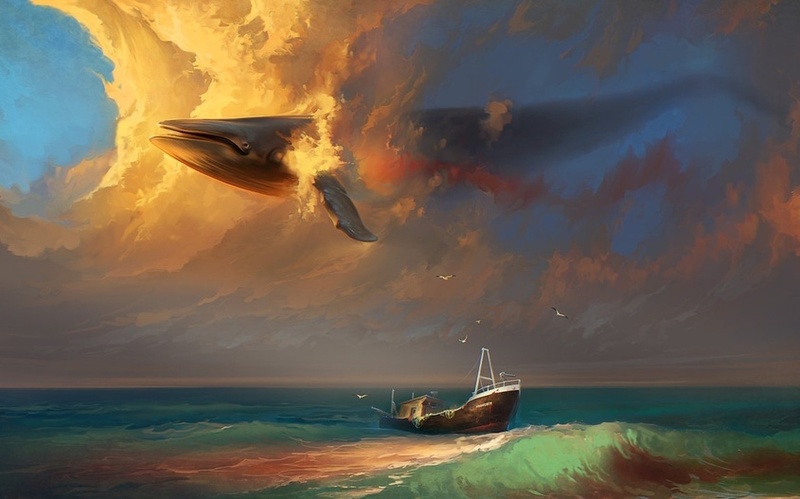 which directly attributes to land, water, and air destruction) will become extinct by the year 2200. Wildlife Services has been killing millions upon millions of animals for a long time. Dr. Bradley Bergstrom, a biologist at Valdosta State University, notes, “The whole approach of just getting rid of the perceived-problem by killing it is something that this agency has been doing for well over 100 years.” And, as they merrily torment, torture, and kill these animals. Wildlife Services continues to be scrutinized by those who want to put them out of business (please see “Exposed: Human-Animal Interactions and the War on Wildlife” and also “Murder Incorporated: Wildlife Services Under Public Scrutiny” and “The Federal Government Killed Nearly Three Million Animals Last Year“). One has to attest that how ironic, our Department of Agricultural is the leading cause for ruin and destruction of environments, ecological systems, and wildlife on our planet. Wildlife Services kills native animals en masse, sometimes based solely, or mostly on farmer’s or rancher’s “perception” of a threat (i.e. a small part of the overall issue, but a good example within this discussion). Worse yet, is the implied situation of environment and ecological habitat damages. The situation becomes insurmountable at the disappearance of wildlife, often deemed necessary for its ecological health, not only to other animals, but to vegetation and water quality. So much is truthfully destroyed by such negligence and mismanagement. Example extended: Often these ranchers place an overabundance of cattle or sheep that merely over-graze and destroy the lands, onto Public Lands. When they want to add to the already over-abundant livestock, they send for Wildlife Services, and at times even the BLM, to eradicate all native life on the ranges – even though it is the wildlife’s home. Why send for either of these government agencies? Because they do things underhandedly that is most often unethical, questionable and often against the law. The ranchers have become a special interest group; they break laws, and these two agencies, both, usurp the laws daily – they cover-up for ranchers constantly, a truth that exceeds all other misinformed facts these agencies give to the public. Though there’s a list of animals killed, there’s little data showing the cause for each killing. Then we discover the methods used and the reasons behind mistakes, which lead to massive kills of other animals that aren’t targeted, and left-out of any report of truthful numbers killed. Science? What science? EPA Environmental Impact Statements? Most that do exist are dishonest in fact, no science, or significant data left out, and actual impact upon any environment or ecological habitat not given. At least two members of Congress have called Wildlife Services secret and opaque for failing to provide more information, and there are mounting calls for an investigation into how it operates. Wildlife Services, “a rogue agency” that is “out of control.” There simply exists no checks-n-balance system to generate a reasonable assumptive equation of “methodology” or “Necessity” for most of the wildlife they trap and kill. The problem here is when we asked for the “science” or the EPA’s requirements of Environmental Impact Statements neither were available. Inner-office memos at that time showed clearly it was their assumptive perception, or they could get-away with killing wolves and to hell with science and who cared if they disturbed or destroyed an environment or ecological system and its health. Apparently, this particular agency hates, in their terms “Enviros” which means environmentalists. . . In a 2012 report, Wildlife Services relied on a National Agricultural Statistics Service survey to show that wildlife caused $944 million in agricultural damage in 2001. A Research Scientist dismissed the “science-based model” and he mentioned that as a document that “basically says they can use whatever methods at their disposal whenever they want apparently was the reasoning to generate this cost in question.” But still the agency provided no explanation for why the kill total can be 1.5 million in one year, and 5 million the next. The $944 million dollars in damage could not be verified either, as there exists no paperwork as evidence, nor reports filed as to occasions. Although voucher trails lead to mostly cattle ranchers, specifically in Oregon, Washington, and Idaho, with some in Nevada and Wyoming, there is simply no paperwork or reports to backup the vouchers. In the Northeast, for example, the elimination of red wolves led to a proliferation of coyotes, which the wolves rarely tolerate in their range. Coyotes push away foxes, which prey on deer mice, which spread ticks. There exists a tick problem, that this author is aware of today, in many counties in southern Oregon, for example, and due to similar reasons here – no science, just hate toward wildlife, and within the ODFW as well. Oregon Representative (D) Peter DeFazio claims, “Their lethal predator control program is particularly inhumane and totally unnecessary.” More details on the documentary “Exposed: USDA’s Secret War on Wildlife” can be seen here. “I’m updating the egregious and unregulated activities of Wildlife Services because when I tell many people about what they do they’re incredulous and think I’m inflating the numbers. Clearly, I’m not. And, in addition to intentional kills, Wildlife Services’ war on wildlife is responsible for slaughtering numerous animals unintentionally, and this collateral damage includes pets and animals who pose no danger or do no damage,” one researcher stated. Wildlife Services No Longer Trusted. On a broader level, Wildlife Services has lost the trust of the American public and Wildlife scientists, over its controversial animal damage control activities to benefit agribusiness interests. We want the conflict of interest situations taken out of the Oregon F&W service immediately, and understand there exists more than appropriate for honest management of our Northwest wildlife. The many Wildlife Services scandals show beyond a doubt this rogue-agency program is out of control. It fails to use the best available science, data gathering techniques (if at all), and pertinent information. This agency does not serve the interests of the public-at-large, rather the interests of a narrow constituency of special interests. These scandals are not to be ignored, that personnel within the Wildlife Services are involved in currently. Many of the personnel demonstrate a psychopathic behavior pattern toward animals, comparable to many patterns found in Serial Killers backgrounds, which merely underscore why we have no reason to believe Wildlife Service’s involvement in killing of wolves in Oregon will be anything but detrimental to the recovery of the endangered gray wolf and other carnivore species within our state. . .
See Center for Biological Diversity, Data Compilation of Annual Animal Killings by APHISWildlife Services (2013) (hereinafter “Data Compilation”) (Center for Biological Diversity compilation of agency program data reports documenting the number of native and invasive animals taken each Fiscal Year from 1996 through 2012); Center for Biological Diversity et al., PETITION FOR RULEMAKING PURSUANT TO THE ADMINISTRATIVE PROCEDURE ACT, 5 U.S.C. § 553(e), TO THE U.S. DEPARTMENT OF AGRICULTURE FOR PROMULGATION OF A REGULATORY SCHEME TO GOVERN THE WILDLIFE SERVICES PROGRAM (Dec. 2, 2013). (“Some quantified or detailed information is required. Without such information, neither the courts nor the public, in reviewing the [the agency’s] decisions, can be assured that the [agency] provided the hard look that it is required to provide.”). Bull, Joseph, et al. “Survival on the border: a population model to evaluate management options for Norway’s wolves Canis lupus.” Wildlife Biology 15.4 (2009): 412-424. Rutledge, Linda Y., et al. (2010) Protection from harvesting restores the natural social structure of eastern wolf packs. Biological Conservation 143.2: 332-339. Rutledge, Linda Y., et al. “Intense harvesting of eastern wolves facilitated hybridization with coyotes.” Ecology and evolution 2.1 (2012): 19-33.